TsukiMoon on the back of Stormy a Norwegian Fjord horse. This past Friday after several miss starts we got our son an evaluation for horse therapy (aka hippo-therapy). I had forgotten about the appointment and was unable to give TsukiMoon a warning that something was new in the routine. Amazingly he rolled with it, possible influence of the drug-trial he is part of. I would pick him up early from school and ran him up to the stable. About two months ago we went and visited the horse therapy place and another stable that teaches riding to neurotypical children. His 17-year-old baby sitter went with us an acted as tour guide. She is avid rider. Her riding stable was the "regular" one. As part of Girl Scout badge she also had done a stint helping out at the therapy stable also. Besides the interest I noticed, I considered that a horse would help him with areas of challenge. Instinctually I felt that being able ride a giant animal would help our son with anxiety and confidence. Also, it could become his "team" sport. Just like other team sports it is critical to learn how to communicate. Our son, normally silent in most groups and doesn't notice when people are talking yet cuts right across them to talk about his enthusiasm. He is afraid to participate with others yet unaware of his actions have on them. Team sports are great for learning how to be part of a group. It is our hope that becoming more attuned to a horse, necessary for riding well, will help TsukiMoon gain; sensitivity to others, build empathy, and be better at reading body language. The therapy place first evaluated TsukiMoon for proprioception. What was determined is that even though he can balance well with his eyes open, he can't when they are shut meaning he relies on vision rather then intuitive body awareness. He also has a weak torso-- no surprise to us. These issues are directly addressed by proficiency on a horse. 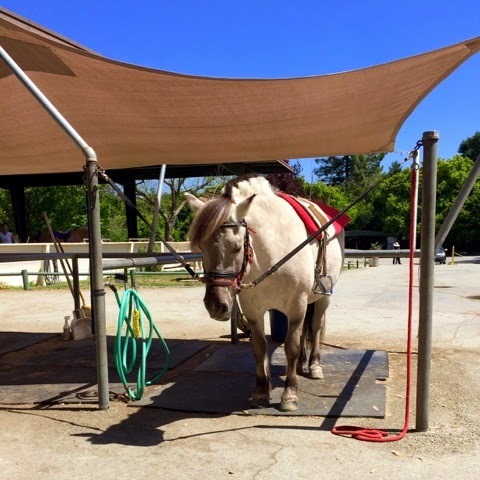 With excited trepidation TsukiMoon was helped on to Stormy, a Norwegian Fjord horse. Ms. O, the trainer, described a fjord horse as a walking sofa. His back is soooooo wide, there was little worry of rolling off. There was little chance of that anyway, on either side of the Stormy, to lend support to TsukiMoon's legs; there was the trainer, a helper, and an occupational therapist. They slowly walked Stormy around the ring to determine if our son could go into adaptive riding or needed more intensive therapy. 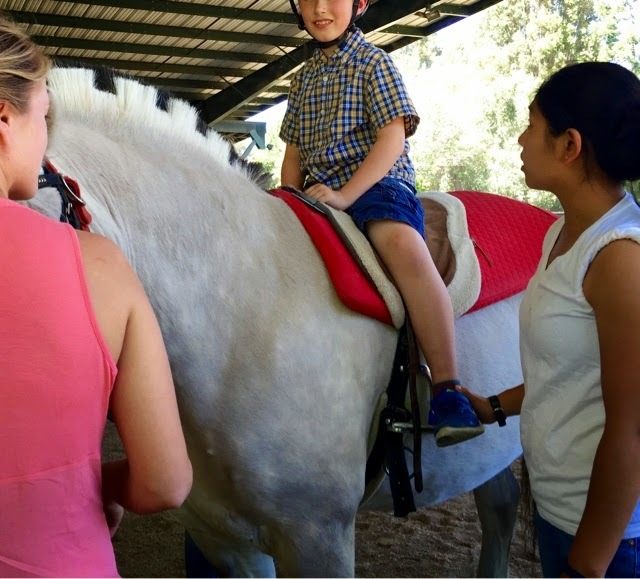 All the people who helped TsukiMoon feel comfortable to be on a horse for a first time. 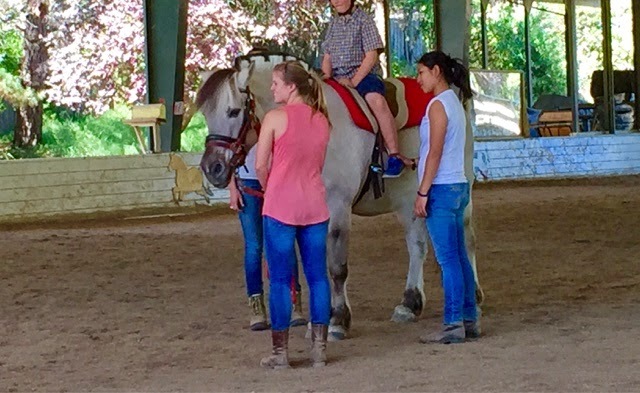 While at the stable I also found out about a social group this summer, 10 weeks that utilizes the horses to help the kids interact with each other. I decided that this might be nice change from the social classes that TsukiMoon have been attending. It should be an engaging change-up and it might help him out. Stormy falling asleep in the warm Springtime sun.